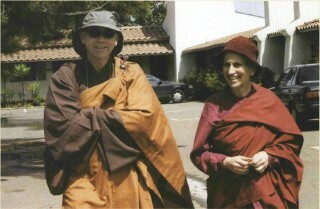 Reverend Master Eko Little, Abbot of Shasta Abbey, with Bhikshuni Thubten Chodron. Photo by Su Co Chon Duc. Imagine: In a time when religion is so often used to create disharmony, forty Buddhist monastics (mostly Westerners and some Asians; an even balance of women and men) meet harmoniously for five days to discuss topics relevant to monastic life and the spread of the Dharma in their countries. Bhikshuni Thubten Chodron reports on the April 2007 assembly of Buddhist traditions: Thai and Sri Lankan Theravada, Vietnamese, Chinese, Japanese, and Korean Ch’an and Pure Land, and various traditions within Tibetan Buddhism. Each year a different monastery hosts the event; this year, the thirteenth, it was at the City of the Dharma Realm, a Chinese monastery with a resident community of about twenty nuns in Sacramento, California. The full daily schedule of meditation and conferring still gave us time to talk and deepen friendships that have formed over the years. The theme was “Health” and Ven. Lobsang Jinpa, a monk who is an Ayurvedic doctor, began our exploration with an overview of Ayurveda. We chanted the “Sutra on Impermanence” and discussed various liturgy used for healing; later I led a meditation on White Tara, a Buddhist deity whose practice promotes long life so that we can practice the Dharma for as long as possible. Theravada monks taught us how to chant several parritas, short sutras that the Buddha wrote as blessings, for healing from illness as well as from grief. We discussed health insurance, for most monastics are uninsured or underinsured. It would indeed be wonderful if we could have a group policy as monastics, but health insurance being what it is in the US, we are not overly optimistic. We also focused on the topic of elder care. How can we help monastics when they are no longer able to be active in the monastery schedule and require full-time care? What will happen to monastics who live on their own when they become old? These are complex questions.